Yes, that’s right. I just did a really dumb pun about…holidays. Frans and I were having a project night last night in our apartment, which both of us really look forward to. It usually involves painting one of our buys from Marktplaats (the Dutch Craigslist..and usually this is Frans), and reading aloud from Eugene Peterson’s memoir, The Pastor (my job). We sip wine or tea and light candles, breathing in small amounts of turpentine-based paint, watching the candlelight flicker against the dark, rain-splashed window, and generally enjoy just being together. And sometimes we just talk. We’re still learning about each other. 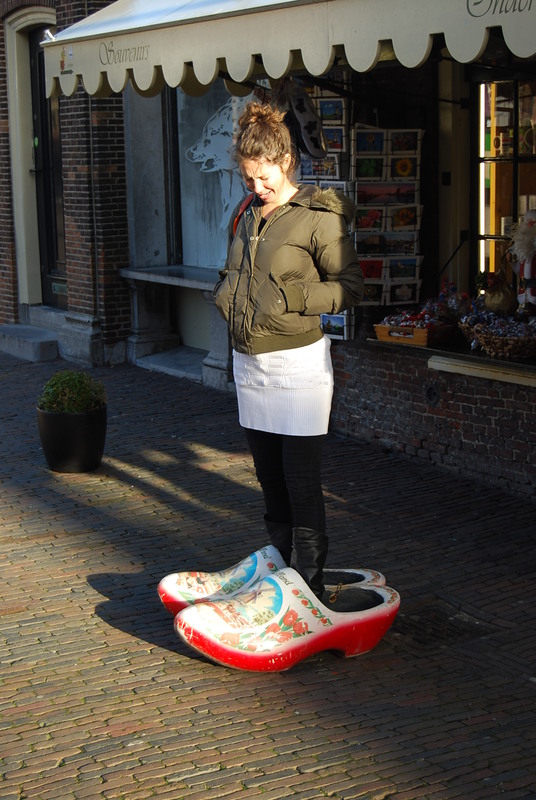 I’m trying to stand in these large, wooden shoes. Just last night we had a conversation about the differences in our expectations of Christmas, based upon both family practices and culture. It lead to a further discussion about holidays here in Holland, compared to what I’m used to in the U.S. So I thought it might be fun to throw both Dutch and American holidays into the ring, and see what we can learn as they duke it out. (Not really, I’m not trying to judge which one is “better,” but I do want to put their positives and negatives side by side like presidential candidate statistics in a news magazine). Important note: For both, you need to be well-stocked with candy. We’re lucky that we still had leftover candy from our Bruiloftsfeest (Dutch wedding reception). Let’s begin with the first holiday I “missed” by being in Holland. Halloween. Halloween is on October 31. Halloween is known by its scary costumes, trick or treating, and copious amounts of candy. In my opinion, Halloween in the States has gotten out of control, and propitiated by commercialism, is now finding its way into theme parks, movies, and all kinds of social media. Yuck. A holiday once allocated to children for dressing up in costume, has now become a gold mine for stores and companies marketing to adults…who seem to gladly spend way to much money on sometimes gory, dark, or skanky costumes (for the ladies). And I must say, just last year, I myself threw a Halloween-based dress up party for my friends. Many came with creative costumes and I myself was Snooki. A modest Snooki, but Snooki nonetheless. I’m not really proud of that fact. I really missed seeing my little nieces and nephew dress up this year. 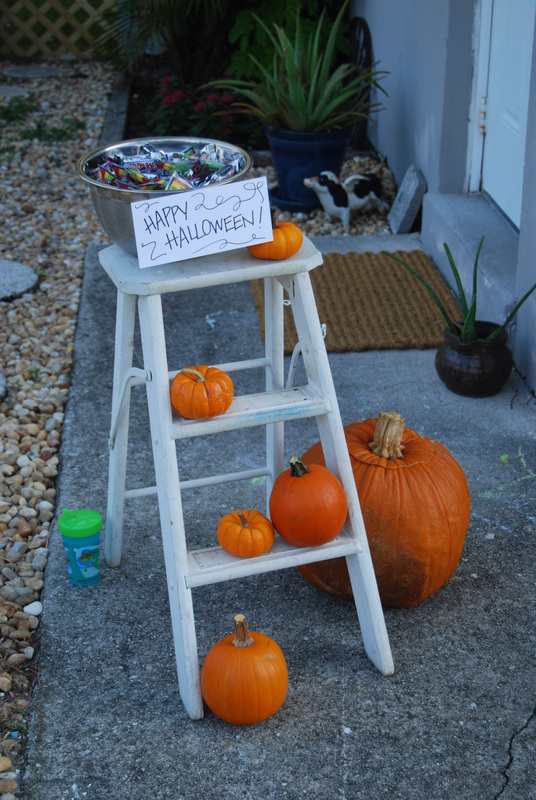 They love it…love joining their friends and creating a costume, carrying a pumpkin from house to house, adoring neighbor to adoring neighbor, and collecting delicious treats to last for weeks. In a land where seasons are known not by changing of weather (it’s pretty much a consistent shades of green, humidity, and heat in Florida), but by celebrations, Halloween in Florida also marks a change of season. Cooler weather is around the corner. My sis-in-law Katie made the super cute display below. I have fun memories of bobbing for apples, attending fall carnivals with games, and planning a costume to be sewn by Mom. My parents did a great job at keeping the gore and evil out of Halloween, and focusing on the fun. Still, I’m not impressed with our consumerist culture and how something that once was fun and simple (unless you go all the way back to its pagan roots hundreds and hundreds of years ago), can become oftentimes ghoulish and well, downright provocative. I’m not proud of the way that American adults have usurped the holiday. Let’s keep it for the children, please. Okay, I know you’re thinking. Erin, this isn’t fair. How can Halloween compete with a holiday with the word “saint” in its title? I know, I know. Completely unfair. And once you see pictures of this little holiday, celebrated Nov. 11th, you’ll fall out of your chair. And the knockout punch? Martin Luther is named after Saint Martin, a Roman soldier turned Christian monk, who was known for his simplicity, kindness, and generosity. St. Martin’s day was a day of feasting before fasting began for the medieval Advent season. 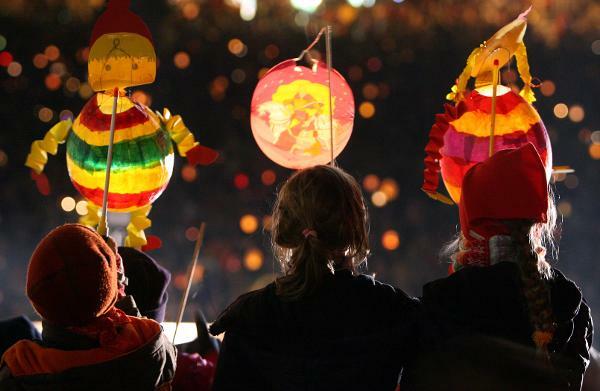 In Holland, children parade through the dark streets and parks holding lit, colorful paper lanterns. They knock on doors and sing Martinmaas songs in order to receive candy. Only children. I did not see one adult trying this out. Frans and I sat in Wannie’s Snackshop and watched hordes of children tinkle the bell at the door and march in, looking for the candy lady. They sang a song in Dutch, proudly holding their homemade or paper mache lanterns. They each took one candy, and turned to leave with their parents. The children were two years old to eleven years old. It is one of the sweetest things I’ve ever seen. Yes, I do miss caramel apples and candy corn. Yes, I did miss people decked out in orange on Oct. 31st(possibly also the result of spending too much time with teachers), and of course I missed seeing the little ones in my family enjoying themselves trick or treating as I did when I was their age. Aren’t most of the things we miss related to good memories? However, I would be a happy woman if the tide went backwards, and instead of what usually happens, the customs and habits of the U.S. making their way via media into Holland, Saint Martin’s Day began to spread across the cities and towns in America (hint, hint). In other words, I wouldn’t mind if Halloween received a knockout punch and was down for the count. Yep, I agree with all of that, KT, but you are good at everything craftsy. Truth. This blog brought back memories of coming up with costumes that you all wanted to wear….I remember one year you and your friend Katie C. decided to be siamese twins! You both started out very excited and end up (if I’m remembering correctly) ready to do each other in! Moving in tandum throughout the neighborhood prooved to be a pretty challenging task for 2 young girls…..wonder if she remembers that year? Also I think that states in the US with more rural populations have more of a harvest festival theme than the goulish tinge that other US locations have…. This was so fun to read….we could all have latterns for the kids to make next year instead! Agree with the comments regarding Halloween, it’s the ‘ghoulish and evil’ things that keep us, a Dutch christian family, from participating. We’d rather not..
Up next, a comparison between Sinterklaas and Santa Claus? If I remember correctly not all of Halloween was ungory in the Hobbie household. One of my favorite pictures is a Halloween when I was young (5 or so) and I am a proud clown (I think). Sitting on the couch behind me with his legs crossed is my father with a horrible and I believe very scary monster/zombie mask. I got to find that picture. You find the picture, and I’ll write a blog about it. I also think I’m in pink and crawling away from the mask. Maybe this is where I got my anti-Halloween stance. Good to see you have much attention for all the different feasts, like Thanksgiving, St Martins etc … I really like that, because it’s a great part of our history. Halloween is definitely a roman catholic feast, celebrated on the night before All Saints (in good christian tradition the new day starts during the ‘evening’ between light and dark), so Halloween can be seen as celebrated on Nov 1 also. All Saints / All Souls was ‘invented’ to give ancestor worship a place and baptize the heathens with less resistance. This still happens in Africa. About Thanksgiving: we have the so-called ‘Dankdag’, which luckily has increasing popularity again. It’s of course the replacement of a pagan harvest feast. So, your beloved husband has been many times to the church on Wednesday night to celebrate kind of Thanksgiving (Thanks, the service has ended!). All christian feasts replaced pagan of Jewish feasts. Christians are remarkable adaptive. As Gerco mentioned, I look forward to your Sinterklaas article. Love your blog. Diederik, you have set the record for the longest and most informational response yet. And, to be truly American, I love it! Thanks for the information…you have a way of sending me to the books. 🙂 Thanks for reading…and don’t hesitate to add your two cents. It only makes the content richer. How interesting. I didn’t know about Saint Martin’s Day. Sounds like a lot of fun, and what a cool way to experience the culture there. We celebrate Reformation Day which is also October 31st, but it is of course hardly known about even among the church sadly.